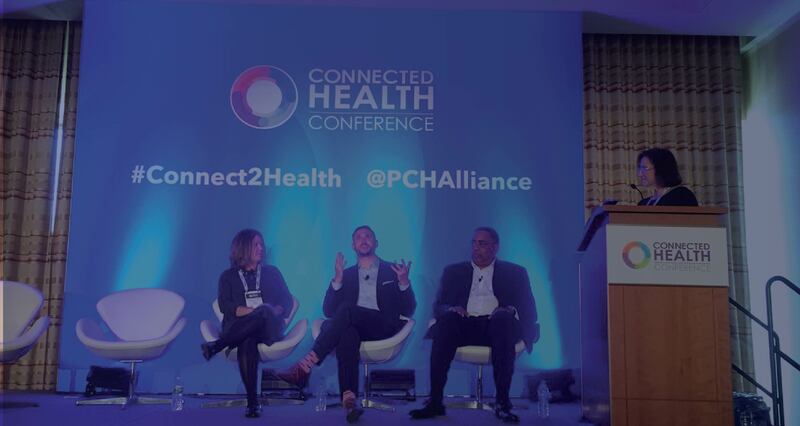 Last week at the PCHA Connected Health Conference in Boston, Validic CEO Drew Schiller was joined on a panel by Patient Advocate Steve Van, and MGH Revere Nurse Manager Christine Goscila, MSN, NP, to discuss firsthand experience of incorporating PGHD into care plans. The panel was moderated by Partners HealthCare Senior Director of Programs and Operations Kelly Santomas, MS, RN. The panel discussed integrating patient-generated health data (PGHD) into care delivery and the potential of these programs to deliver new insights about lifestyle, disease progression, therapeutic response and adherence. The panelists delved into how device capabilities, analytics and processes are evolving to support these programs and the patients, as well as providers, involved. Patient Advocate Steve Van was diagnosed with type II diabetes nearly 20 years ago, and struggled to manage his condition and his overall health. In 2016, he enrolled in a program of care that leveraged his data he generated daily – from wearables, a bluetooth connected weight scale, a blood pressure monitor, and a glucometer – to inform the care team. Through this data, his care team was able to detect an unnoticed snacking habit that caused his blood sugar to rise every evening. They intervened, and Steve was able to make a change to improve his health. “I was able to look at data that was being collected, that in the past I wasn’t able to see. I wasn’t able to see what that data really meant,” said Van, explaining how this process improved his understanding of his condition. As a result, Steve lowered his a1c by two points and has lost 50 pounds. The biggest difference, he says, was his improved relationship with his providers and his deepened understanding of his health. Before the program, “I wasn’t going by the data, I was going by what I thought I knew. And I think that happens for a lot of us,” said Van. With the use of his data by his care team, he could learn what the data mean – and what impact they would have. For Christine Goscila, the ability to integrate PGHD into the existing clinical workflow has provided new opportunities to more quickly intervene and interact with patients more appropriately and effectively. Rather than trying to manage all patients with hypertension in a program equally, her team was able to focus on those who needed guidance, and encourage those who were self-managing. This way, care teams are able to reach out only to the patients who need it. “If we can touch patients more often,” said Goscila, behavior can change, and patients can ultimately be healthier. And, for providers, this means focusing on delivering high-value care, rather than nondescript touchpoints with a high volume of patients who may all be managing their condition in different ways and at different success levels. Drew Schiller, who has experience developing technologies to integrate patient-generated health data, agrees. “Digital health tools are allowing providers to spend less time checking in, and more time helping out,” he said. On top of that, it allows providers to offer more meaningful services. “It helped them work at the top of their licenses; it helped their workflows and their work satisfaction,” said Goscila, when explaining how it impacted clinicians’ day to day. Though the use of this data can offer a wealth of insights for both patients and clinicians, many providers are hesitant to instate such programs, for a fear of data overload on care teams. However, the panelists agreed that the key to avoiding this is instead to set expectations and guidelines up front, and to only deliverable actionable data into the system. “Establishing agreed upon goals between the care teams and the patients up front is key to success in remote care,” said Schiller. Both patients and providers need to know what to expect of the program, of the other stakeholders, and of themselves. The key is to present this data in a seamless way for all parties involved, so that rather than adding additional work, they make the care delivery model simpler. “”How do we reduce the friction around using patient-generated health data?” posed Schiller. Ultimately, programs which leverage patient-generated health data must focus on ensuring the processes involve engage patients to encourage their continued participation in the program. “We’ve got to keep [patients] connected, because if we don’t keep them connected, we’re going to lose them,” said Goscila. Missed the panel? Watch it on-demand here.